The Facebook Back to Barsoom Group has announced a special screening of John Carter on December 1,2012, at the Aero Theater in Santa Monica, California. The event begins at 1:00PM with fan art, books, and items displayed in the lobby and culminates in a screening of John Carter that begins at 2:30. The group has already confirmed that all the members of the “Council of Helium” from the opening scenes of the movie will be in attendance; other VIPs include Jim Sullos, President of Edgar Rice Burroughs Inc. The group has an event listing at Indigogo.com where tickets and other items can be purchased. 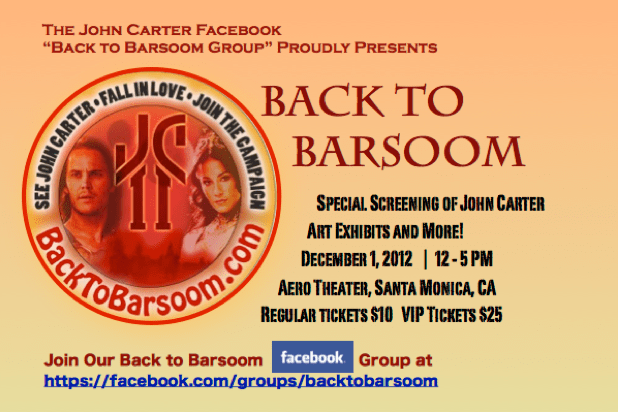 The 11,000 member strong John Carter Back to Barsoom Facebook Group is having a screening of John Carter at the Aero Theator in Santa Monica on December 1st to show our support for the film and let Disney know WE STILL LIVE! We need to raise $4,000 to cover the cost of renting the theater, the print, plus putting on a great show that includes lobby displays, art exhibits, and more. We want a FULL HOUSE and you can help us do it! And if you’re not in Los Angeles — never fear, you can participate as a supporter and patron from anywhere in the world. Just choose the “Patron” option and that way you’ll be listed as a supporter on the souvenir program and on our websites. Let Disney know we are a global group of committed fans and we’re not going away! Help us spread the word — use the social sharing options and let your friends know. Together we can turn this into a wonderful event that sends a message! And here is how the group announced it on the group’s Facebook group page. WE ARE HAVING A SPECIAL SCREENING OF JOHN CARTER! The Back To Barsoom Group is very proud and pleased to announce: A John Carter Screening at the Aero Theater, in Santa Monica, California on Saturday, December 1, 2012. Disney has approved the screening so we are all set to go and will be signing the contract any day now. The actual title for this screening will be: “Back To Barsoom Celebrates: 100 Years of JOHN CARTER of Mars. Presented By The Back To Barsoom Campaign Group.” We are all very excited about this event. We have a guest list we are working on – and whomever you are thinking of right now, they are probably already on our “to be invited” list from the cast/actors, producers, directors, crew, ERB family & friends, and more! The site and link to purchase tickets for the John Carter Screening is at www.indiegogo.com/backtobarsoom1?a=1102759 You have the choice of purchasing a $10.00 ticket for a seat, a $10.00 non-resident Virtual ticket, or a VIP $25.00 ticket. Fanboys are so hilarious and relentless; even when their precious movie bombs, they will not accept the fact that maybe, perhaps, the film just wasn’t that great to begin with. And for the record: I loved the JC books. I just hated Andrew Stanton’s Wall-E-fied kids version, lacking in real drama and exotic wonder, but teeming with memories of Prince of Persia, smacked with dialogue delivery from Lord of the Rings. It is going to be very exciting seeing John Carter on the BIG screen once again. Cast & crew are being invited, some are already attending, and lots of ERB and surprises in store! Should be a GREAT event! Thank you to all who are donating! It’s very appreciated to help with this event! Unfortunately we’re not on the same continent (considering my tastes I often think I was born in the wrong country! ), so I bought the non resident ticket. Nice screening to all! Khanada is the creator and keeper of the buttons ….I’ll check with her. LA is a bit far from Dallas, but I will be contributing. I do hope you have a packed house. Are those buttons available? I am sorry, but we cannot make it. I hope you have a packed house.